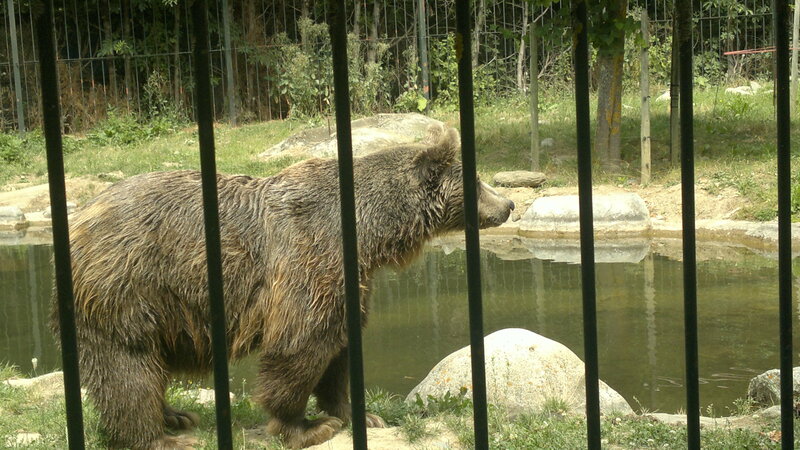 Brown Bear (Grizzly): almost extinct in Spain. The Brown Bear is a type of bear, that long time ago was abundant in some mountain areas of Spain. He used to live in Asia forest, Europe and North America. Now is believed that, in Iberian peninsula are betwen 80-100 copies remain. They are located between the Pyrenees and the Cantabrian Sea. 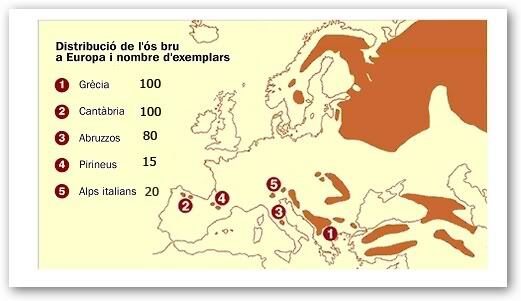 Distribution of Brown Bear in Europe. World wide distribution of Brown Bear. 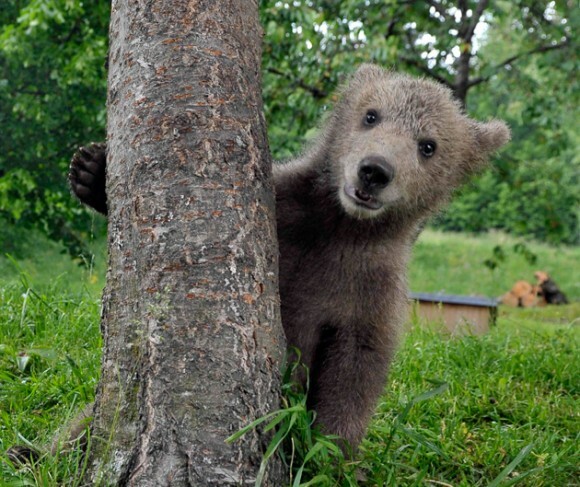 The iberian brown bears are the smallest. The males are around 180kgr weight, and females around 140. 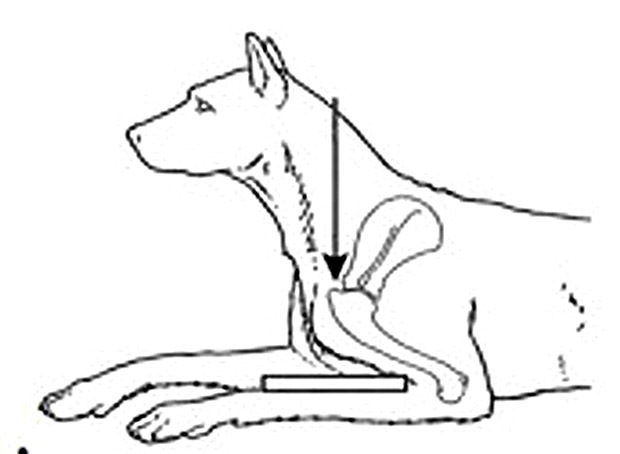 The height are between 90cm. and one meter, and from head to tail the size are around two meters. They often lives between in the range of altitude, between 1.100meters and 1.400meters, in the mountains. Although we can see them sometimes from the 500 meters, until grasslands of 2000 meters. They are mainly vegetarians (despite his carnivore aspect), their dentition are ready to eat plant and fruit diet, although they may occasionally eat meat, if they hunt some deer or ungulate of great size. They hibernate in winter by food shortages, and in the other stations are constantly looking for food. The brown bear in Spain, are very difficult to see in wild life. They used to live about an average of 25 years. 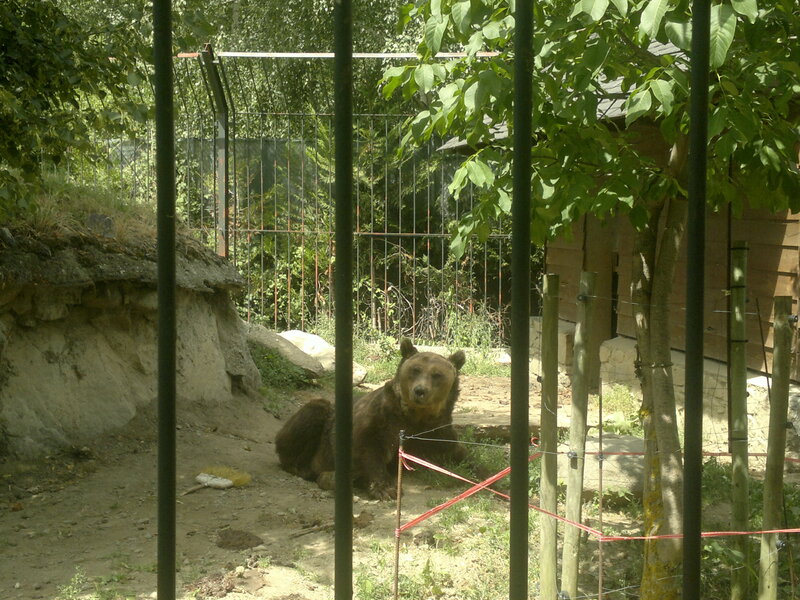 This post is to introduce you a pair of brown bears, kept in captivity in the Vall d’Aran (that is an area of Pyrenees), specifically in the village of Arties. Currently are living in this place an older male and a female, one male lived previously but was replaced, some time ago, by a female. The two specimens lives in a paddock, with some vegetation and a pond in the center to swimming. They also have a cave made of rocks, to rest or to refuge. 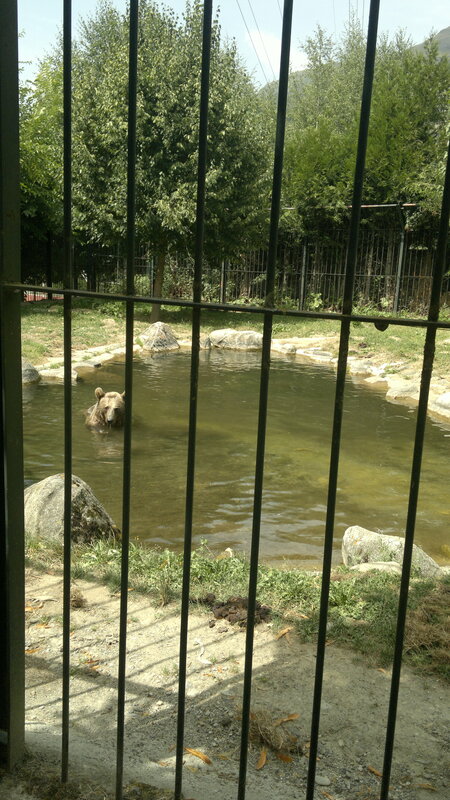 The enclosure where the bears are, is in the outside of the village of Arties, but there are not exposed to generate tourism, because there is no indication, or display… that these bears are in this place. I think that is a very good option, not to advertise on this, it deserves more credibility. I think that these beare are here, because if they weren’t, and were free in the forest, surely that wouldn’t survive. In front of the fence, there is a legend that explains the disastrous situation of this animal, specially in the Iberian Peninsula. It also explains a little bit, how is this animal. I think this is a good option, specially to sensitize people, children, etc.. that this animal is almost extinct in our enviroment, and we must be very careful with the enviroment, for things like this, become less frequent. The fact is that nowadays the brown bear in the Iberian Peninsula, is slowly recovering. There is a gradual increase, but slowly, in the number of copies released. All thanks to good reintroduction and hunt ban. 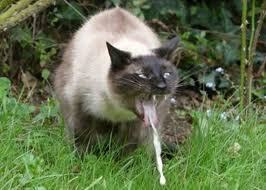 Here there are some pictures, of this funny and beautiful animals. 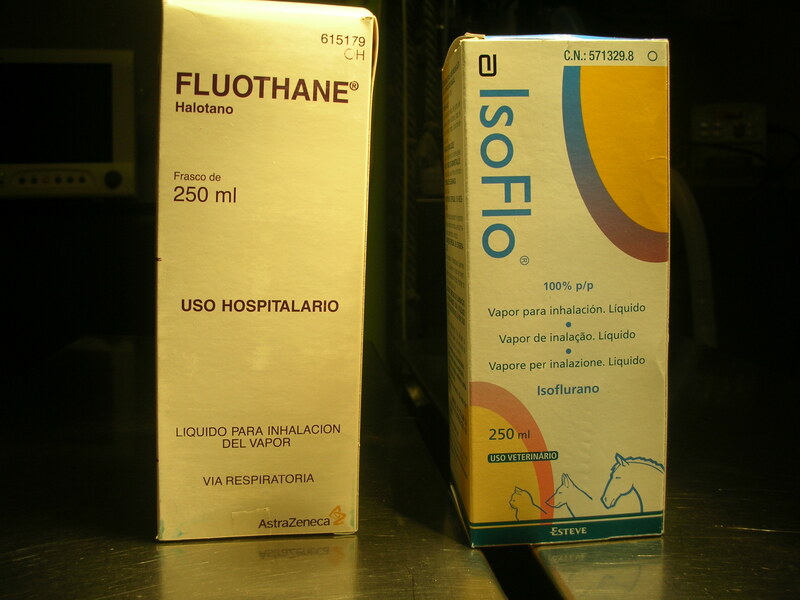 ← Disfunción cognitiva: cuando nuestra mascota se hace mayor.